CONDITIONED dives back into the world of gardener Charles, his friends and the state of his mental health – one year on. We meet loner Simon and his battle with the outside world, co-dependent Martha and her abusive husband Clive, neurotic poet Catherine on the verge of getting married, Tony, who finds his strange brother Charles a challenge, psychic Elaine looking for a new direction in life and quirky widow Sarah Roseberg who has a go at sorting out all of their problems. CONDITIONS aimed to sensitise readers and make them think about tolerance and acceptance. CONDITIONED wants readers to look beyond their attitude towards Conditions and examine what we all do and what we can do to overcome our challenges. The sequel is another snapshot of this circle of friends. Some will have improved their lives, others will not. “The writing, while subtle, brings out intense conflicts … The book … made me wrangle with the one overwhelming condition that wove Charles’s friends together: Empathy. The book is not about one set of symptoms or even one character, but it reflects back to us some of the standard reactions to people who might be affected by such a disorder. Are they really unable to do a day’s work, or is it all an excuse? Are they telling the truth or are they making up stories to get attention? Why should they be treated differently and given special privileges when they aren’t pulling their weight? Are they just exploiting the system? Should they just be locked up? … When we get to know both his friends and those who aren’t that close to Charles, we come to understand that all of them (and by extension, also us) have their own conditions, and we shouldn’t be so quick to judge. Even the most enlightened of us can have prejudices and misjudge others if we are not open and refuse to take them on their own terms. The short answer is: I left a few of the characters in the lurch and wanted to give them a much needed closure. Conditions has an ensemble cast, a group of friends and family who gather around Charles, a man with a mental condition. His condition and how people handle it becomes the centre piece, even though the other characters have their own lives and problems, too. You can follow these links to read my character profiles for Charles, Elaine, Catherine, Martha, Tony, Simon, and Edgar. Every life and individual situation is different and so it was important for me to show a snapshot of the lives and of the problems. To end ‘Conditions’ on a “and they lived happily-ever-after” note would have been simplifying the Conditions and unrealistic. However, there were many specific calls to help Martha out of her ditch and to explore Simon’s life further. To not turn the sequel into a mere soap opera by continuing all sub-plots with new and sensational developments I chose a setting that unites all the characters one year on and provides another snapshot. Some will have improved their lives, others will not. 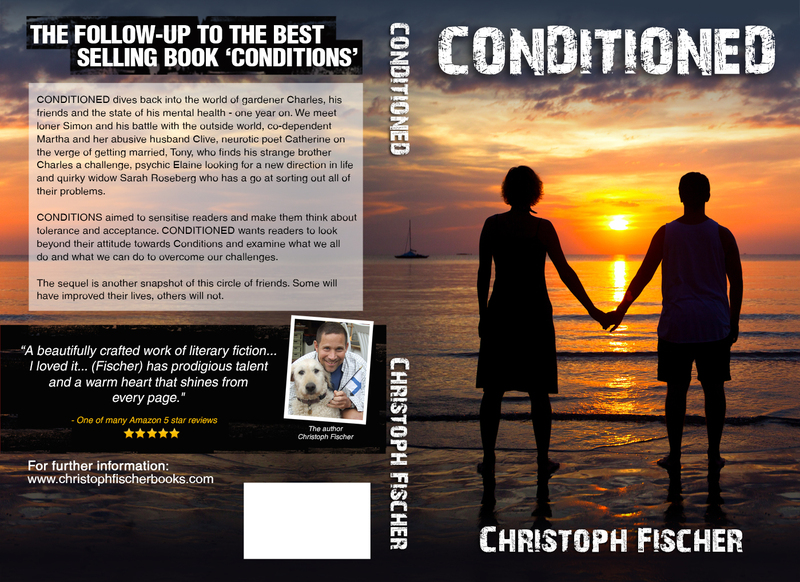 My aim with “Conditions” was to sensitise readers and make them think about tolerance and acceptance. With the sequel, “Conditioned” I want readers to look beyond their attitude towards Conditions and more at what we all do and what we can do to overcome our challenges. 1. existing under or subject to conditions. 2. characterized by a predictable or consistent pattern of behavior or thought as a result of being subjected to certaincircumstances or conditions. 3. acquired through conditioning: conditioned behavior patterns. 4. in a fit or suitable condition.